The Apple 27inch Thunderbolt Display is three years old this July. All other Apple products have been upgraded and superceeded but this screen has been at the top of its field during its three year reign and Apple seem reluctant to alter the formula. That dominance, and it is still a very popular display, will come to a very rapid end this July with its first real competitor from LG. 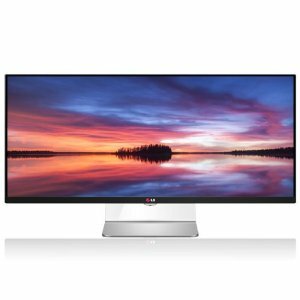 The LG 34UM95 has a very dull title but is a 34 inch display with a resolution of 3440 X 1440 and features Thunderbolt 2 connectivity. The Apple 27″ Display is just Thunderbolt 1 and is just 2560 x 1440 . The LG is nearly a 4k resolution display and is classed as the worlds first QHD display at 34″. Whats more the styling is aimed straight to match the aesthetics of the Mac Pro finished in a similarly polished black whilst with a curved silver back and and a pedestal stand that is almost identical to an iMac or Thunderbolt Display but adds some clear perspex edginess- it could be described as floating over your desk. In every way its the perfect match for the Apple Mac and is even suited to the MacBook Pros with their Retina display. 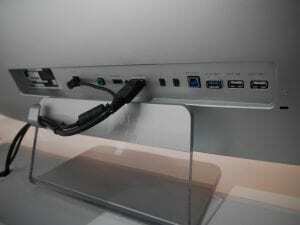 The MacBooks have an external resolution that is higher than the Apple Thunderbolt Display can offer and the LG 34UM95 QHD steps right in there with its massive almost 4k resolution; technically a 4K display must be higher than 4000 resolution. The LG 34″ display has the 21:9 aspect ratio rather than the Apple’s 16:9. The LG ratio means you can achieve a 4 screen split. LG are aiming this product straight at the new cylindrical Mac Pro and it comes in the box with 2 software apps for the Apple Mac Pro – the 4 screen split software and a True Colour Finder that allows pinpoint colour accuracy. Beware though as the LG 34UM95 doesn’t work on the older Mac Pro but does also work happily on Windows based systems unlike the Apple Thunderbolt Display. Our only criticism is the sound quality isn’t that great but then its not a TV and is a professional display and if you need sound then get some external speakers. The Apple Store does offer an alternative to their own 27 inch display and sell the Sharp 32″ PN-321 at £3299. Its an incredibly poor value for money display and why Apple chose this Sharp as their only alternative display for the Mac Pro is weird. Technically its is higher resolution at 3840 and is TRUE 4k display. The LG unit is but 20% of the cost of the Sharp. The LG 34″QHD is priced at £7.90 per week on a three year business lease whereas the Apple 27″ Display is priced slightly cheaper at £7.50 per week plus VAT. Given the high cost of the new Apple Mac Pro then leasing makes these professional products accessible and affordable. Adding a Mac Pro Quad Core with an LG Thunderbolt 2 display will cost £29.50 per week and that includes three years warranty that Apple would normally charge extra for. If you want 32GB Ram in your new Mac Pro then its just £1 extra !- thats normally £320 on the Apple Store. Apple’s gift is taking established technologies and re-inventing them. Apple would be wise to base their future displays on this outstanding LG display. Leasing and hiring Apple computers from HardSoft is a great solution for creative professionals as after just 2 years into the lease you can choose to upgrade to the latest Mac for little extra cost. Its just like upgrading your Mobile Phone. HardSoft are Authorised Apple Resellers who specialise in leasing to the creative industries with bespoke systems and packages including Adobe software and storage from Drobo, Lacie and Promise and have been trading for over 25 years with offices in Shoreditch/Tech City and head office in Hertfordshire.